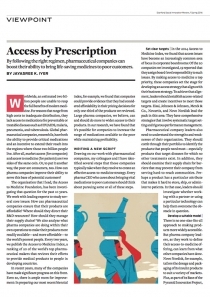 The Access to Medicine Index has been analysing 20 of the largest R&D-based pharmaceutical companies by revenue on how they address access to medicines in LMICs for over ten years. Cancer has previously not been included within the disease scope of the Index. As the burden of cancer grows in low- and middle-income countries, the decision was made to evaluate companies’ actions with regard to cancer in the 2018 index. This article sets out how the research team adapted the methodology to take account of the complexity of providing access to cancer control. 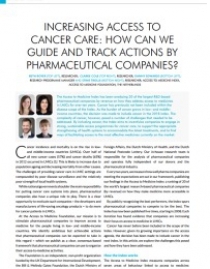 By including cancer, the Index aims to incentivise companies to engage in strong, sustainable access programmes for cancer care, to support the appropriate strengthening of health systems to accommodate the latest treatments, and to find ways of facilitating access to medicines currently on the market.